Testimonials who overcame high FSH and age related infertility to conceive naturally with acupuncture and herbal medicine treatment. Please read our patients own testimonials on how acupuncture and Chinese herbal medicine helped them for unexplained infertility, conceived naturally, and healthy babies. If you are trying to through IVF, acupuncture can help quality of your eggs, reduce your stress and diminish the side effects from stimulation medications. If you suffer from recurrent pregnancy loss or been diagnosed with autoimmune infertility please try acupuncture and Chinese medicine. Acupuncture provides safe effective drug free and natural approach for PCOS. Acupuncture treat the whole person. Not only does acupuncture help you relieve the symptoms but also treat the underlying causes. 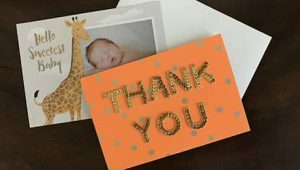 There are some patients thank you cards and notes after they were successfully conceived.